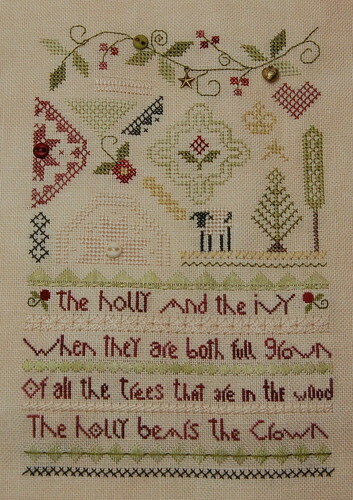 Nicole's Needlework: Holly and Ivy Sampler Finished! 32 ct. Oatmeal linen by R&R, Various silk threads (1 over 2). Not a lot of progress, but I'm loving it. I'm definitely on a Shepherd's Bush kick! :) Write soon! Wonderful finish! Seeing this always reminds me of the carol. I had to sing it so many seasons for school choir. Great start as well! I love your finish. It looks great. These are some great designs. The Holly and Ivy sampler is beautiful. And the little sheep is adorable. I really can imagine you have a Sheperds Bush kick: the Stockings is a great design. SB is a great kick to be on. The designs always come out so nice. I can't believe how quickly you got Holly and Ivy done. It looks wonderful. And a great start on The Stockings too. Beautiful finish Nicole, I love the colours in this piece. I just finished The Stockings and have the Holly and Ivy on the qsnaps ready to start this weekend! Congratulations on the finish Nicole! 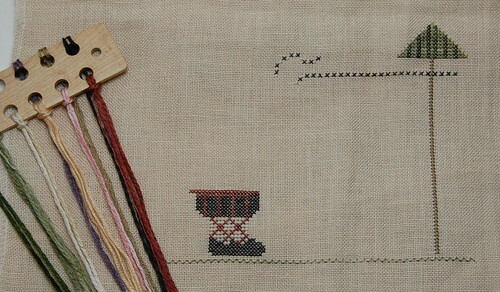 What a beautiful sampler. I forget how much I like SB until I see one of their designs stitched and I want to start all my stashed SB projects. Love your finish! I love sheep, so I think that's my favorite part! Very pretty! And the stockings piece will be awesome too! I LOVE the Holly and Ivy Nicole~~ It is just beautiful...I was lucky enough to see the top part in progress last Sat....You sure did whip things up quickly! As usual, perfectly done!! WOW...smokin' needle Nicole!! The love fihish!! Turbo stitcher Nicole! Fabulous! Thanks for sharing! Gorgeous finish and great new start. very pretty finish and off to a great new start. It is so beautiful, Nicole! That is one of my favorite Shepherd's Bush designs. You do such perfect work. :) Love the Santa in your new start. You will finish that before Christmas, I am sure! I love both your finish and your new start! Yummy! Goodness Nicole....that was a quick stitch! Love your new one too. wOW... that was a quick finish. 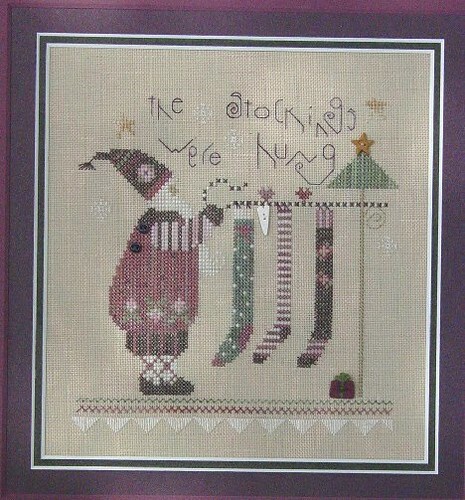 The Holly and Ivy Sampler is beautiful Congrats on your finish. What a lovely finish! 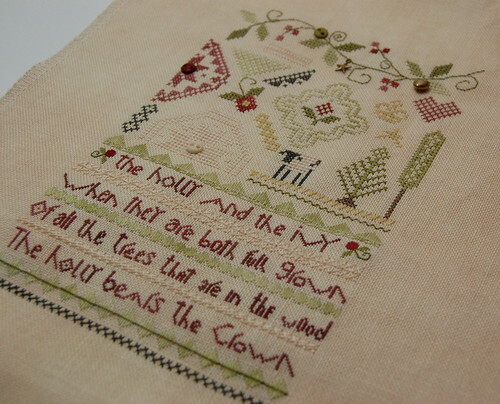 I've never stitched a Shepherds Bush design, but this one is tempting me. Gee, you're really stitching fast at the moment! Love both these designs and enjoying seeing your pictures. Stockings is so cute! Love the finish! That was super fast!!! And the new start is adorable. I love your Holly & Ivy - somehow I had forgotten about this one. Must get it! And your new start - very cute! What a gorgeous finish, well done, you sure stitched it up quickly. Your new start looks lovely as well. Beautifully done, and great new start. You certainly have a great eye for pieces I love! Beautiful finish! I have always loved this design from Shepherd's Bush!